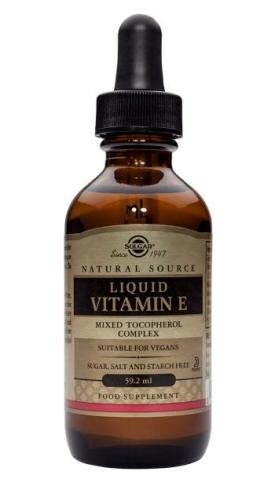 Vitamin E mixed tocopherol complex. Vitamin E is the major fat soluble antioxidant that protects our bodies against free-radical damage. It prevents saturated fatty acids and vitamin A from breaking down and combining with other substances that may become harmful to the body. The more fat one consumes, the more Vitamin E required. 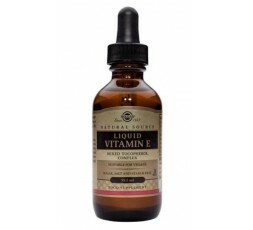 Vitamin E also has the ability to unite with oxygen and prevent it from being converted into toxic peroxides. This leaves the red blood cells more fully supplied with the pure oxygen that the blood carries to the heart and other organs. Although all tissues in the body require sufficient Vitamin E, the cardiovascular, nervous (including brain), reproductive and immune systems and the eyes, joints and skin are especially susceptible to problems due to excessively low concentrations. SUGGESTED USE: As a food supplement for adults, 0.5 ml daily, preferably at mealtime, or as directed by a healthcare practitioner. Do not exceed directions for use.